You know sometimes I think all your precious ladies might get tired of making quilts day after day. After a while you think why do I keep doing this? I want you to know that the little boy and the little girl that are going to get one of your quilts today don’t know that you have already make 100’s and 100’s of quilts each. They don’t know how tired of fabric and sewing you are. What they do know is that someone or ones who are very special made something just for them! Someone loved them enough to make these special and beautiful quilts and knitted blankets. Their eyes dance and their pain subsides for awhile as they relish the treasure they were just given! Notes like this remind me of why I quilt and why I give most of my creations away. I am now heading back to the sewing machine, with a renewed sense of purpose. It’a lovely feeling, isn’t it? I’ve almost got my quilts ready for 100 quilts for kids and I can’t wait to give them! I have loved doing quilts for the 100 Quilts for Kids too. It has kept me focused and motivated. It is such a great idea. A wonderful post and so glad you shared. I lead a group that only makes quilts for donation and I will be sharing these words with them next time we meet. I am now even more inspired to make a few more Quilts for kids. I got a little teary reading that, and I have never even made a quilt for donation. I’m so proud of all the people that do. Great work. I can highly recommend making a charity quilt. It is strange/hard at first to send the quilt out into the world not knowing where it will end up, but it does something for the soul that can not be measured. As far as my quilting ability goes, I have so far only started 3 quilts, all with a particular recipient in mind, and I am yet to finish any. But when I do, I am thinking quilt #4 may very well be a charity quilt. Thanks for the inspiration. Absolutely beautiful. Thank you for sharing this with us – and inspiring me. I want to get more involved with charity quilts – I think yours are all so beautiful and I can’t imagine how much joy you bring to others. They do feel incredibly lucky and loved, but I know your heart is happy too – glad you got to read this note to know how treasured your gifts are! PS. Digging the new blog header something fierce! It looks awesome. I am so glad you liked the header. It was my project for the afternoon. I am slowly revamping and reworking the site. I too am a Project Linus Volunteer and found inspiration in your post today!! Thank you! I am so glad you found inspiration in the thank you note too. It is a good reminder we make a difference. What a worthwhile cause! 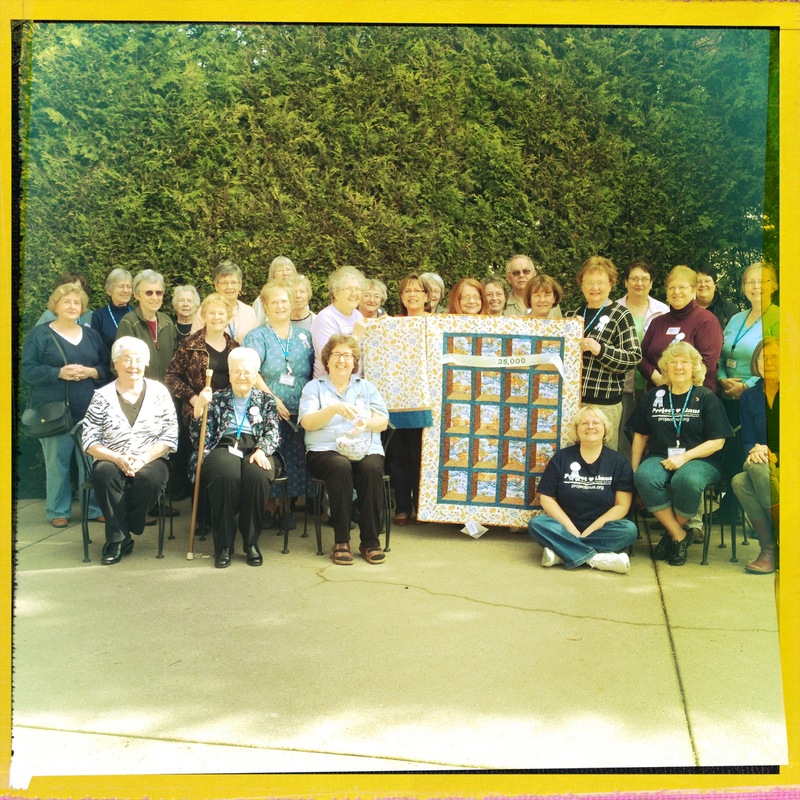 I love being a small part of the donation quilts we make at our guild. Thanks for sharing. Great post, very refreshing. I want to do more charity quilts.